With the arrival of spring, the appearance of multiple allergens such as pollens, biting insects, dust mites, etc., can trigger allergic reactions in some horses, symptoms often manifesting on a cutaneous and respiratory level. When such signs appear, horse owners will generally call their vet who may recommend a blood test in the hope of identifying precisely the responsible allergen. The frequent outcome of a blood test requested following the appearance of respiratory problems is that the laboratory carrying out analysis will conclude that a food allergy is the cause. It then follows that the complete diet of the horse is called into question with the supposed allergens being suppressed. It also happens that at the end of these tests, horses are declared allergic to all the feed allergens tested ! Consequently, this type of situation can lead us to question the reliability of these blood tests. Knowing that in humans, about 50 to 60% of individuals are said to be allergic, when the reality is that they are not. (we talk about “false positives“) (source 1), it is legitimate to ask if this is not also true for tests developed for use in the horse. 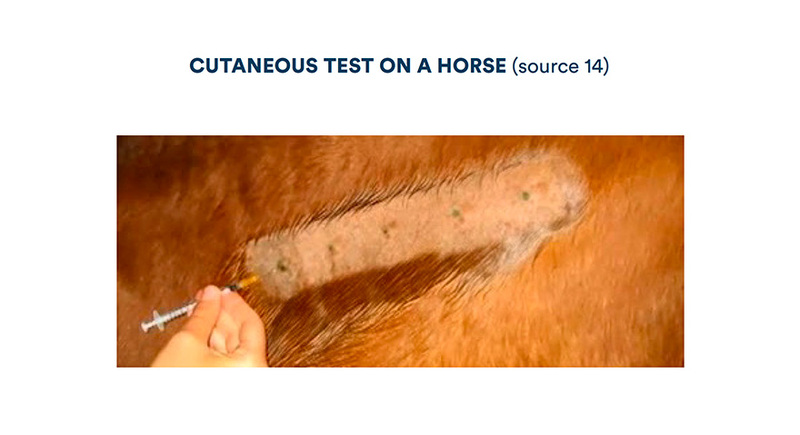 If this is the case, what tests can we carry out to know if a horse is really suffering from a food allergy? Generally, an allergic reaction corresponds to a hypersensitivity of immunological origin, provoking symptoms that are reproducible, objective, initiated by exposure to a stimuli which, at the same dose, provokes no reaction in a healthy individual. (Definition of the “International Task Force on Canine Atopic Dermatitis”). More precisely, a food allergy is characterised by an abnormal immune reaction following the ingestion of a food containing one or more antigens (molecules recognised by antibodies or cells of the immune system) called allergens. These latter are responsible for this excessive immune reaction. The symptoms are systematically reproducible following each new exposure to the allergen (1). Inhalation: via the respiratory system. Ingestion: via the mouth and digestive system. Injection: via the skin from an insect bite or a needle. Contact: via the skin (source 2). In the case of a food allergy, the main entry route for the allergen is obviously ingestion (2). 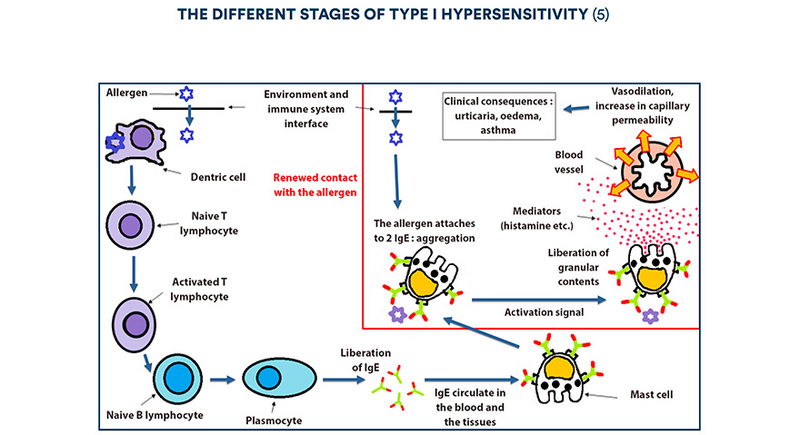 Allergic reactions bring into play different hypersensitivity mechanisms (classified into four types by Gell and Coombs), even if it is principally the type I reaction (HSI) which is triggered. This hypersensitivity implies a specific recognition of the antigen by the immune system, more precisely by antibodies: type E immunoglobulins (see below diagram), from where it is also obtains the name of IgE dependant allergy. The symptoms rapidly appear after contact with the allergen, we also call it immediate hypersensitivity (source 5). 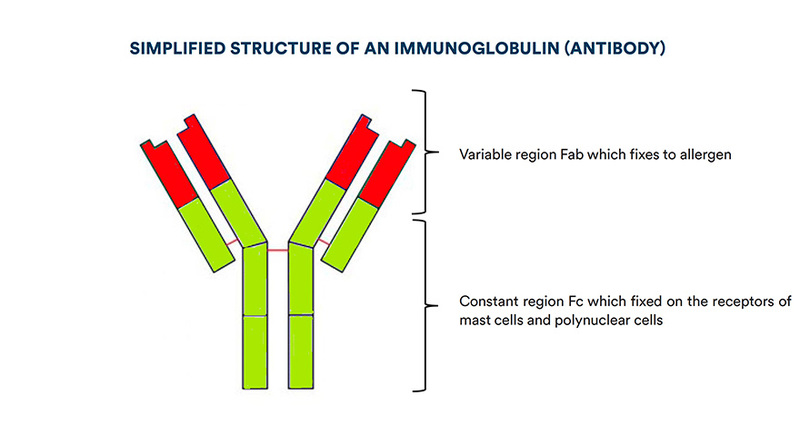 The immunoglobulins present two fragments (see the above diagram): a constant fragment F with which they fix onto mast cell receptors and polynuclear basophils, and a Fab region, which binds itself to the allergen. We talk about specific IgE because this Fab region is specific to one allergen. However, if two allergens possess closely neighbouring forms, these are able to be recognised by the same IgE antibod. 1st stage, known as sensitisation, without clinical signs: this can last a few weeks to a few years. Antigen presenting cells (called dendritic cells), present in the tissues on the frontier between the outside and inside environment of the organism (skin, respiratory and digestive mucosa,), continuously capture penetrating antigens. Once the antigens are interned, dendritic cells migrate towards the lymph nodes finishing their maturing. They then interact with T lymphocytes and also B lymphocytes via T-helper lymphocytes. The B lymphocytes develop into plasmocytes and will produce a large number of IgE. These immunoglobulins will then circulate in the blood and the tissues, either in a free state or fixed to the surface of mast cells and polynuclear basophils. The IgE are able to last many months on the surface of cells but only a few days in a free state in the blood (5). Everybody synthesises IgE, type I hypersensitivity being a normal protective immune reaction against foreign elements. However, allergic individuals differentiate from healthy individuals on an immunological plan because they produce them in an exaggerated manner. 2nd Stage, the effector stage: in the case of re-exposure to the allergen, the recognition of the latter by IgE situated on the surface of mast calls or to a lesser degree by basophils, leads to an activation in cascade by these cells. However, this activation necessitates the allergen being bivalent, that is to say that it is capable of attaching to two neighbouring IgE at the same time. This phenomena is called “aggregation” of IgE by the allergen. It brings about a modification in the structure and function of the cell membrane, leading to an activation signal at the origin of degranulation episode, that is to say the release of secretory granules (contained within the mast cells and basophils) into the extracellular medium. These vesicles are limited by a cytoplasmic membrane containing the numerous mediators preformed in the immediate phase, notably proteases and histamine (chemical mediator, that is to say a molecule capable of activating cells possessing the specific receptor of histamine). Histamine diffuses across the tissues and attaches to its’ receptors : it causes vasodilation and an increase in capillary permeability, leading to the appearance of visible clinical signs (urticaria etc.). As for proteases, they initiate inflammation and local tissue damage. Symptoms generally appear in 10 to 20 minutes (5). Even though the prevalence of food allergies is not exactly known in the horse, it is estimated to be low (sources 2, 3, 4). Pruritis (itching) often leading to a alopcia (loss of hair exposing the skin), even wounds when the itchiness is important and chronic. Urticaria (sudden appearance of numerous oedematous raised patches over a bigger or smaller expanse, also called “nettle rash” or “hives”). ELISA (Enzyme Linked Immunosorbent Assay) serological tests, carried out on blood samples are presented by laboratories that market them as being a recognised alternative to skin prick tests in allergy diagnosis. These costly tests classify allergic components into 2 groups: the aeroallergens (inhaled into the respiratory tract) and the trophallergens (ingested into the digestive tract). The principle of these immuno-enzymatic tests rests on dosing allergen-specific E immunoglobulins (IgE) present in the serum (a part of the blood) of the animal. In practice, these tests are very easily carried out. The vet takes a small blood sample (a few ml) from the horse showing clinical symptoms consistent with an allergic reaction. Next, on returning to his clinic he centrifuges the sample and extracts the serum which he injects into another sample tube. The latter then only has to be sent to the laboratory for analysis. Seeing the ease of carrying out these analyses, it is tempting to fall back on them as soon as an allergy is suspected. However it has been proven in man and in other animal species that in the case of feed allergies, that these tests are unreliable (sources 6, 7). In equines, a study (1) recently published in 2014 came to the same conclusions. Phase I: Two blood tests were carried out aimed at measuring specific IgE food allergens (soya, maize, molasses, wheat, sugar-beet, oats, alfalfa, rye, carob and barley). One the first day and the other 14 days later, the day before the start of phase II. Phase II: Following the results of blood test number1 of phase I, the ponies considered “positive” to one or more food allergens started provocation trials on day 1 of phase II. Each pony that had tested positive received 100g of the presumed allergen twice a day for two weeks, in addition to the base diet. The ponies that had tested positive to more than one allergen underwent more than one provocation test (one per allergen) separated by a weeks rest (without any provocation) during which the ponies only consumed the base ration (hay + vitamin and mineral supplement). Clinical examination: before and 30 minutes after the first feed of phase II, then every hour for 12h, then every 3h for the next 36 hours, and finally 3 times daily for 10 days. The parameters monitored were the following: heart rate, respiratory rate, temperature, presence of urticaria, signs of itching (skin lesions, etc. ), colic and diarrhoea. Laboratory parameters: the first day of phase II, before the feed, and at 6 and 12h after, urea, lactate, haematocrit. The following day, 1h after the feed, analysis for an acute inflammatory phase protein the SAA (serum amyloid A). Blood test n°1: 6 ponies out of 17 (35%) were tested positive, and three of them for more than one allergen. Blood test n°2: 7 ponies out of 17 (41%) tested positive, knowing that for each subject, a single allergen was held responsible. In all, 10 ponies out of 17 (59%) reacted positively to at least one of the food allergens tested. 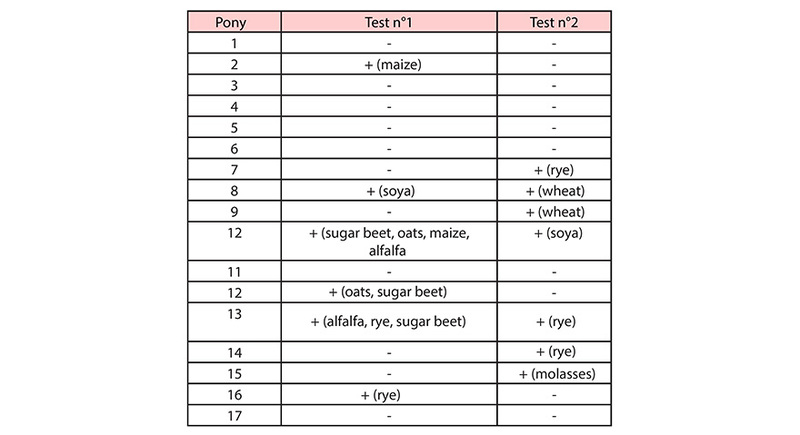 Out of these 10 “positive” subjects, only 3 of them were “positive” during the 2 tests, knowing that only a single pony (n°13) reacted twice to the same allergen (rye). Finally, only 7 ponies out of 17 (41%) were had no reaction to the 2 tests. Clinical parameters: no sign of allergy was observed; only two ponies showed dropping of a slightly abnormal consistency (3.5/5 instead of 4/5 for the other ponies). Bloody parameters: only pony n°13 saw his level of serum amyloid A(SAA)* increase (93,2 mg / l) during the provocation test with rye. *SAA is an acute inflammation protein, produced in the main by the liver. It is used as an allergy marker in human asthma sufferers. However, the pertinence of this marker has not yet been tested in horses. The results of the study showed that a commercially available IgE based food allergy detection test did not produce consistent results in healthy ponies. 41 % (7/17) of ponies were tested “positive” to one or more allergens in test n°1 but did not react during test n°2 or inversely. Concerning the 3 ponies that reacted to both tests, the suspected allergens were different in each test. Only the results of pony n°13 were consistent for 1 of the 3 allergens detected during test n°1 that was also found in test n°2 (rye). Furthermore, none of the 6 ponies declared “positive” following blood test n°1 developed clinical signs in favour of an eventual allergy during the provocation trials of phase II. Concerning pony n°13, even if he showed no clinical signs of a feed allergy, he was twice tested positive to rye. Furthermore, during the phase II provocation test with rye, blood analysis carried out 1 hour after the feed on the second day showed a moderate rise in the acute inflammation phase protein SAA. This increase, judged as moderate by the authors, is nevertheless an indication of the presence of an inflammatory stimuli. However, even if the results of tests carried out on this pony seem consistent (with the exception of the lack of specificity of blood test 1 of Phase I), the authors of the study do not commit themselves as to the existence of a possible hypersensitivity to rye by pony n°13. Concerning the method of analysis, the authors of the study were unable to obtain more information on the exact mechanism of the test used. They did not know therefore either the threshold of IgE from which the pony was considered positive, nor the type of antibody used in the detection of IgE in the animals’ blood. In consequence, they are not able to offer the exact reason for these inconsistent results. However, the results of this study confirm yet again that commercially available blood tests are not scientifically valid and are not able to be considered as a reliable diagnosis method for food allergies. Such inconsistencies have also been observed in other IgE detection tests: intradermal tests or ELISA, used with the aim of detecting skin allergies in horses but also in food allergy detection tests in cats, dogs and humans. The authors conclude that an IgE based food allergy test provided inconsistent results in healthy ponies. These erroneous results from this commercially available test could lead to inappropriate and unnecessary changes in the feed ration when eliminating the presumed allergen. The conclusions of this study confirmed those of Wagner (2009), that there exists no scientific publication that validates the use of blood tests in determining food allergies (source 8). Thus, although these tests are very easy to carry out, they are unreliable. The number of false positives generated by them is important: numerous are the individuals that present high levels of IgE without showing any clinical signs of food allergy. No relation between the level of blood antibodies and those in target organs has been shown up to now (source 9). Depending on the season, the level of IgE increases in a significant way in healthy horses (source 10). It is not obligatory for individuals presenting high levels of IgE to show clinical signs of allergy, and in consequence they are not necessarily allergic (source 11). The quality of allergens used: for the equine species, no standardisation of allergens has been made (9). The same IgE can bind to different antigens if the latter presents a similar or closely neighbouring structure. We talk about a cross reactivity. Therefore with today’s techniques, when a level of IgE is high, it is impossible to say if the immunoglobulins are binding to to “targeted” allergen or to a similar molecule to the latter (11). In consequence, these blood tests only allow the detection of IgE production, but in no case the diagnosis of a food allergy. IV. What test to carry out to know if a horse is allergic? Skin tests using intradermal reactions allow a localised recreation of a type I hypersensitive reaction. The suspected allergen (or allergens), as well as a negative control (often a glycerine solution) and a positive control (codeine and/or histamine) are injected intradermally. 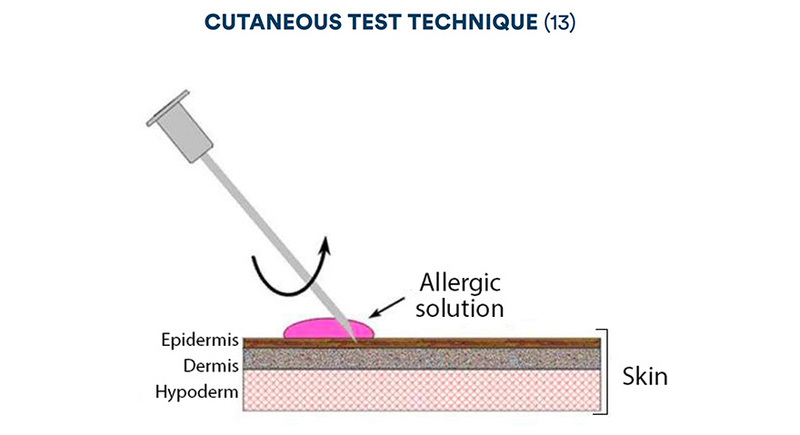 The negative control eliminates a friction allergy whilst the second control, meant to provoke a localised reaction, ensures that the animal is not or no longer under the effect of anti-allergic medications that were perhaps administered prior to the test (source 6). If the cutaneous mast cells are sensitised to one or more of the injected allergens, degranulation occurs and localised symptoms appear (erythema, papule) in 10 to 20 minutes (source 6). The test is read therefore by comparison with the positive and negative control sites 15 to 30 minutes after the different injections to detect an eventual immediate hypersensitivity then at 24 hours for delayed hypersensitivity. So that the tests can be interpreted, the negative control must correspond to a erythematous papule less than 5mm in diameter whilst the positive control must show a diameter greater than 1cm. Generally a test is considered positive if there is erythema and if the diameter of the reaction is superior or equal to the average of the two control sites (6). Even if intradermal reaction skin tests are more reliable than blood tests, the risk of obtaining false positives and false negatives stays nevertheless high. Therefore they do not allow a definite diagnosis of food allergy. This test is the simplest and most reliable because it provides a direct relation between the allergen and the clinical signs. It is considered as the reference test in man, cats and dogs (1).When we suspect a food allergy in a horse showing clinical signs compatible with the latter, the exclusion test consists of removing one ingredient at a time from the horses’ ration until the disappearance of symptoms is observed. Indeed, if the animal gets better with no treatment (in a few days to 2 -3 weeks), it is logical to think that the last ingredient removed possibly contained the allergen responsible for the clinical signs. Also, after the exclusion phase comes the reintroduction phase: the last ingredient to be excluded (probably containing the allergen) is reintroduced into the ration. The rapid reappearance of symptoms following this reintroduction provides the proof that the horse is allergic to this ingredient (6). NB : other tests are available for horses, such as basophil degranulation tests, or lymphoblastic transformation test. Nevertheless, their reliability has not been shown (6). In the case of a true food allergy, the first stage of treatment consists of eliminating the allergen from the ration. Once the allergen has been identified, then eliminated and the clinical signs of allergy have disappeared, the vet may propose an allergen-specific immunotherapy, also called desensitisation or anti-allergen vaccination. The aim of this therapy is to progressively accustom the organism to the allergen in question in order that it develops tolerance towards the latter. An injectable preparation (“vaccine”) made from the selected allergen is injected in increasing doses and at regular intervals under the skin of the animal, the objective being to develop a tolerance towards the allergen. It should be noted that desensitisation is mainly used in horses suffering from skin or respiratory problems (source 15). The addition of Omega 3s in the ration (by using REVERDY feeds or via REVERDY OMEGA OIL) can influence the immune response, and in consequence reduces the clinical signs of allergy (source 16). Indeed, they notably act on leukotrienes and cytokines, mediators present in the secreting granules of mast cells and basophils which are liberated in case of contact by these cells with the allergen and at the root of certain clinical signs of allergy. A number of scientific studies have proved that blood tests for food allergies based on IgE levels produce incoherent results. Thus, their lack of reliability can lead to inappropriate and unnecessary changes in the feed ration. (2) Burke D.J., Food allergy in horses – nothing to sneeze at ! !, Tribute Equine Nutrition/Kalmbach Feeds, Inc.
(3) Kentucky Equine Research staff, Food allergy testing in horses, EQUINEWS, 3 Novembre 2014. (6) Bertholdy Thomas, Etude de l’atopie chez les équidés: étude comparative de son traitement chez l’homme et chez le cheval, thèse, janvier 2005. (10) Wilkolel PM, Pomorski ZJ, Szczepanik MP, Adamek L, Pluta M, Taszkum I, Golynski M, Rozwod A, Sitkowski W, Assessment of serum levels of allergen-specific immunoglobulin E in different seasons and breeds in healthy horses, Journal of Veterinary Science, 2014, 17(2):331-7. (12) Moneret-Vautrin DA, Kanny G, Halpern G, Detection of antifood IgE by in vitro tests and diagnosis of food allergy.